Product Showcase: Final Basic Grey Eskimo Kisses and a HUGE Giveaway! First let us wish our reporter Anne Hafermann a very Happy Birthday! We hope you have a wonderful day Annie! The final installment of this three part article is going to be focusing on the embellishments that go along with this line. I have to say that when using these, it was a joy. The rubons went on beautifully, the woolies were great and had the perfect amount of adhesiveness, and the cardstock stickers were perfect. The chipboard did still have a problem with the stickiness, but Basic Grey took note and contacted their distributor and that is a problem that is now fixed! YAY! What do you think? Did this line ROCK your world? Was is something you might pass up? Leave a comment by noon EST Thursday to be entered to win this amazing prize package! Love this collection and I think you've made some wonderful cards. The colours are so pretty, and those woolies stickers are adorable. I love this line! I've gotten the chance to play with some of it for a guest dt spot. I'm thinking I need more of this yummy line! Oh I tell you, Eskimo Kisses definitely rocks my world...love, love, love that line! This is a very cute line. I love it. Thanks for a chance to win. I just love this! Thanks for all of this information you are putting there! I live in a scrapbooking black hole, and this site is awesome! The product line is awesome. I just love that felt deer. Thanks so much for the chance to win such an amazing prize package. Beautiful collections and very cute cards! Love them! What a super cute collection! I'd love to mix some old and new holiday photos into an album using this line! Thank you for the giveaway! Those cards are adorable. And the collection.. the fabric brads, the woolies. Heck all of it is magnificent. I have been very impressed with all things BG. I really love this line because it doesn't use too much of the traditional colors of Xmas! I'm waiting to buy the whole line till I can find it cheaper than retail, if you know what I mean, but this is definitely on my Christmas list this year!! 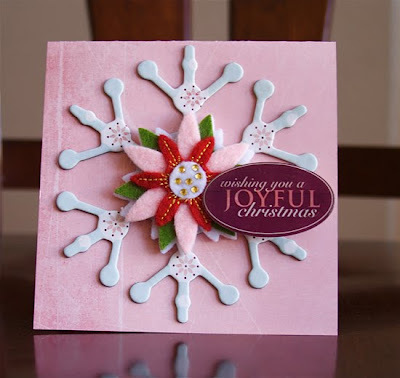 Beautiful cards and wonderful reviews as always! I LOVE BG!!! This collection is fabulous and I will definitely be picking this up for my Christmas cards this year. Can't wait! What a gorgeous line (and awesome examples too). I am making all my Christmas cards this year, from the Eskimo Kisses line! I love it! This is such a pretty collection! The brads alone have me drooling. Love the cards you made - you've inspired me! I totally love this line by BG, it is so cute!! Love the woolies!! 2. Your cards are fabulous!!! 3. That line and that prize would most definitely ROCK my world!!! I love everything about this line! 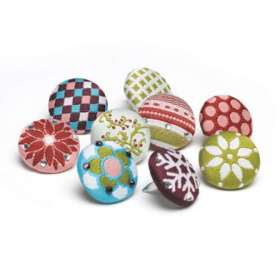 The colors, patterns and the designs are just so cute and can be used for more than just holiday projects. 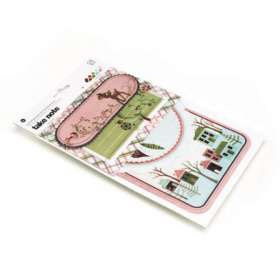 I think my favorites are the winter house paper, chipboard stickers and the woolies. I think this line rocks! I love all the new embellishments. Basic Grey always has fun papers. Love the all the projects too! I love all of BG's collections, but this one was especially cute! This line is BEAUTIFUL! I love the fabric covered brads and the woolies. ANd the paper, and the stickers, and the chipboard...ALL OF IT!! I would LOVE to win! Love the embellishments from this line! The patterned paper was a wee bit purply/pinky for my very boyish family, but that doesn't keep me from loving it! Love, love, LOVE this line!! Basic Grey always knocks it out of the park. It's a very pretty line. I like that it's not a real traditionally colored line. Actually it was a take or leave it until you did the reviews. Seeing it in-depth changed my mind. Now it's a must have for sure. everything looks wonderful. pick me! Eskimo Kisses is darling & Basic Grey just keeps getting better & better! Love everything done here! I have used a bunch of the Eskimo Kisses line for cards and items to sell at an open house....it was beautiful and perfect for the projects. Your cards are stunning. I love the clean lines! Thanks so much for another giveaway! Eskimo Kisses is a definite must have! The Eskimo kisses line is adorable! I especially love the woolies...so cute!! Enormously cute! Thanks for sharing all the great inspiration! Love this collection! You made some really awesome cards! Thanks so much for sharing! First Happy Birthday Anne! I love Basic Grey and this collection I think is by far my FAVORITE!! Thanks for the chance to win! I love your cards, they are very cute. This line is great. I just love it. The embellishment rock!!! You are a card QUEEEEEEEEN! I love them all! ...and i wanna win....LOL! I love this paper line! The colors and designs are so adorable! Thanks for this opportunity to win such a great prize! I love this line because it has a simple artistic and almost vintage feel to it. Beautiful work Basic Grey! I love these colours, so festive:) But they are not your typical holiday colours which is what makes it fun for me. Thanks for the review and chance to win! I've always "liked" Basic Grey but recently I've rediscovered them and think their products are "fantastic". 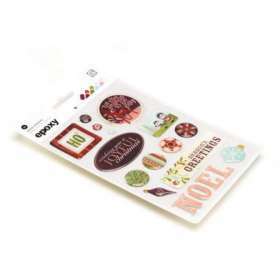 They make it so easy to scrapbook, make cards or any other creative expression I might use them for. Thanks for the chance to win! Oh my! I am drooling-in-love! Love this line....love to win it! I love this line, especially the Woolies. Thanks for the chance to win. Gorgeous cards, Ashley!! I can always count on Basic Grey to WOW me with their products and the Eskimo Kisses line is no exception! This line is gorgeous!! Love the cards you made. I love, love, LOVE this line! My life would be so complete if I had it! :-) Your cards are so gorgeous!!!! 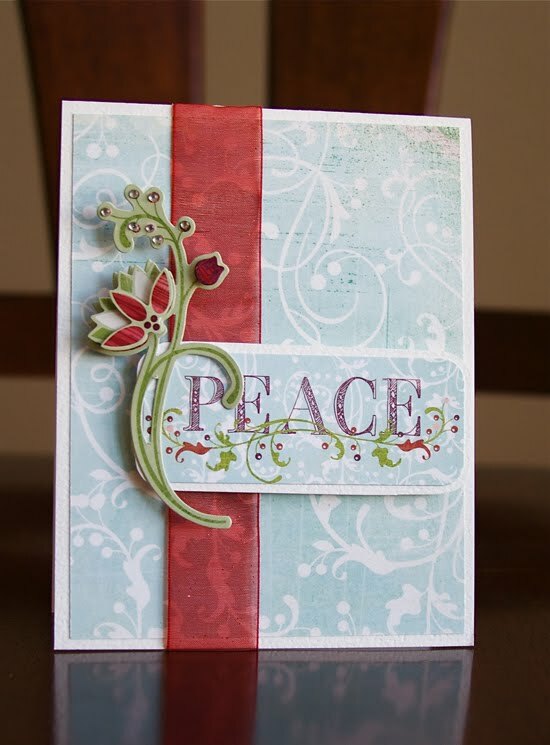 Beautiful cards using a beautiful line! Happy Birthday to You happy Birthday to You Happy Birthday Dear Anne Happy Birthday to you! I really love Basic Grey and this line is absolutly gorgeous. Would love the opportunity to play with the whole all. Thanks for the chance!! This is super cute. So creative and colorful...Great job! BG had totally Rocked this line!!! It is beyond cute and I can't wait to get my hands on some of this and make those cute cards and create some awesome LO's this holiday season! Thanks for an awesome opportunity! I love this line! I just adore the embellies! What fabulous cards! This line rocks! I can't wait to get my hands on some... I particularly love the color combo! :) Your designs are beautiful. I LOVE BG's embellies. The new stuff they've been coming out with are fantastic!! It's easy to see why they are one of the top companies out there. I love BG, and this line has really grown on me - I would love the complete collection! I used products from this line in a class at the Seattle CKC and really liked the unique lace paper and the journaling cards w/ matching overlay transparencies. Fabulous! I'd love to own some of these products for myself. I do love this, just like I love all BG. However being in AZ with not many SNOW pics, it would not be on my must have list. Of course, seeing all the awesome cards made with the line, might shift it over to the must have list. I have always been a huge fan of Basic Grey and this line is seriously gorgeous. Love it!!! 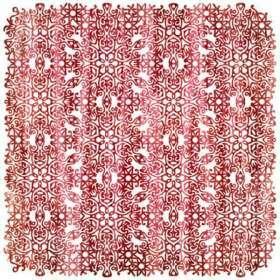 It would rock to use for my Christmas Journal this year!! All your projects with this set have been gorgeous!! I usually only buy 1 line of xmas paper each year. I think this will be the one. (unless of course, I'm lucky enough to win it!!) Thanks for the review & the giveaway!! These cards are all so beautiful!!TFS!! it's all so beautiful!! i especially love the little felties...but i would love to work with all of it :-) happy holidays! Gorgeous! Can't go wrong with BG, I always say! Seriously love it! I haven't found anything about any Basic Gray line that I haven't fallen in love with. This one is no exception! This line is adorable and the cards are fresh and cute without being too cutesy. Love it! I love everything BasicGrey does, but this line is just too cute. That deer is endearing! I am new to scrapbooking and feel the urge to start making cards too. Your samples are amazing. This is one of 2 Christmas lines that I'm loving this year. You have made some amazing cards. What an amazing giveaway! Thanks for the chance to win! Love all the cards you made, especially that first one. So darling. I love the woolies, too. That Deer is just darling! Ashley, your cards are beautiful!!! Such inspiration! I just love this line from Basic Grey. Thanks for the chance. the very first time i laid eyes on this collection, i wasn't so sure about it, but after seeing all the examples here, it is certainly a MUST HAVE! the embellishments are especially cute... love the woolies and the brads! I love the cards you made with this collection. That deer is the cutest! Thanks for the chance to win! Love this line & all the projects you did are beautiful & very inspiring! Thanks for sharing your talent. Love this collection, I can't wait to try it out for myself! I absolutely LOVE it! Thank you showing us all the neat things to do with the papers! I am a bit surprised at just how MUCH I like this collection. I've been buying less BG lately because their designs just haven't been my style as of late, but this is great stuff! Yes perfect! But I don't think I could bring these gorgeous supplies to life the way you did. Amazing! When I first saw this line I didn't realize how beautiful it was. Seeing the card examples here I now love it! It's definitely on my Christmas wish list! I love , love ,love this line. I am a faithful BG Christmas fan but I think this one is the best one yet. Thanks for sharing! Not only that I love all the layouts and cards you all have made. I hope I win this, cause it will be the only way I can get it this year. I've gotten so mixed up with all the Christmas paper to look at this year, I overlooked this one! It is soft and delicate and exactly what I've been looking for! Love the cards you made! It makes me want to play with those woolies!!! I love the cards and projucts you made. This colection is gorgeous! I don't think I can let this one pass me by. Basic Grey is on the top of my list when I look at their Holiday papers. I was addicted to the Figgy Pudding line over the last two holiday seasaons. Thanks for the opportunity! I love the colors in this line and I love what you did with the papers and embellishments. Wow!! I love every piece of this stuff...gorgeous. Just the thing to get me started making cards! 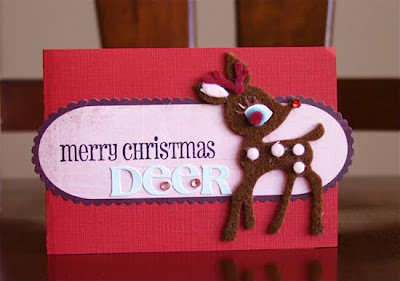 OK, that little felt reindeer looks just like Rudolph in the Christmas special they play every year, going to have to look for him for a layout and he is very cute on your card! Oh the lusciousness of it all! 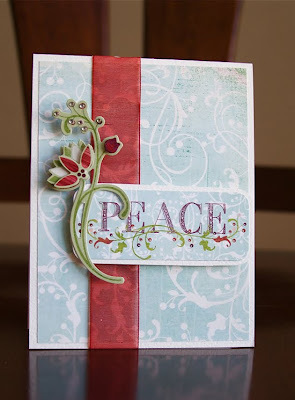 What beautiful cards and tags. Makes me want to make my own Christmas cards, even tho I don't have the time to attempt it! What beautiful papers and embellies! I've really enjoyed your spotlight on Eskimo Kisses, especially your layouts. I think the papers are really sweet, and the coordinating brads are great! How can you not love a line with such a cute name...? I love all things Basic Grey and the projects you created are beautiful!! LOVE the cards you've made with this collection, just so cute! thanks! I love the woolies and stickers. The colors are bright and cheery .. perfect for a winter day. Love those little cards you made!!! This has given me so many ideas for my own Christmas cards this year! Especially the last circle one! Love it! Thanks so much!!! Wow, it is a pretty line! I have loved all the eye candy you have shown off this week!!!! Count me in on the chance to win this amazing giveaway!!!! I absolutely love this pack!! I've saved all of your reviews for inspiration, you girls have made some gorgeous things with this!! Pass this up??? HOW could you pass this up??? NEVER!!! I need it ALL! Hehe! And I LOVE the "Eskimo Kisses" title! Having lived in Alaska for 5 years before moving to Florida it's totally appropriate for my family's pages! Basic Grey is my ALL TIME FAVORITE line of papers and this is one of the BEST!!! Keep up the great work! Gorgeous cards Ashley! I love BasicGrey! They are my all time favourite manufacturer! OMG! I think I need to wipe the drool off my laptop! Darn! Wish my Mike's would get some of this line! This really is a fabulous line! Great Colors!!!! TFS! I love basic grey and this is just another reason why I love it. This line is what Christmas should be - I love the colors and the cute little reindeer. It reminds me of the original rudolph the red nose reindeer that they show every year on tv. I can't wait to get my hands on this line. Love it!! Didn't know if I would like all the pinks, but I have to say it is gorgeous in all the projects you made. I look forward to seeing the line in person and buying a bunch. This is an outstanding collection. 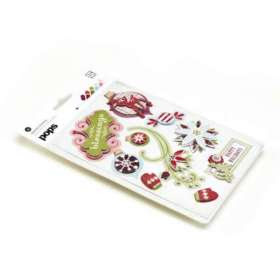 I can see lots of cards, scrapbooking pages and papercrafts being made with it. Why yes, it DOES rock my world! So pretty! I love Christmas, and I love this line - esp. the felt pieces. THanks for the chance to win! I love the cards that you made with this collection. I think that I will have to do some scraplifting. And this line is just so cute. I love all things Basic Grey and Eskimo Kisses makes me pucker up my lips ready to smooch each and every piece. Enjoyed your three part highlight of this line. Everytime I see pictures of Eskimo Kisses, I love it more and more. 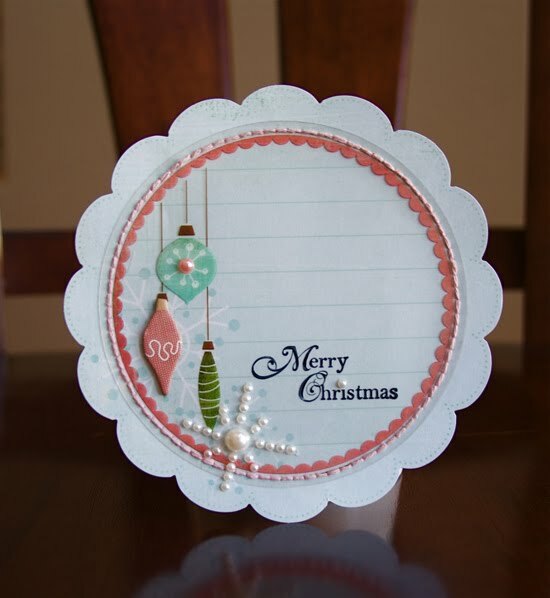 I love the softer colors that would work for more than just Christmas. And who can resist that adorable felt deer?! Basic Grey knocked it out of the park again! Love it. Adorable cards! LOve this collection, so cute. I'll be honest, I'm not usually much of a fan of Basic Grey, but I think this collection is so cute! I actually bought a few of the papers at my LSS the other day! Great cards. I would love to make some! You like BG Eskimao Kisses. Amazing cards! What a fab giveaway!!! The embellishments for the Eskimo Kisses line make these cards look splendidly expensive and difficult to make but are actually NEITHER! I will really get to fool my friends when I make my holiday cards this year. Can't wait to get ahold of them! 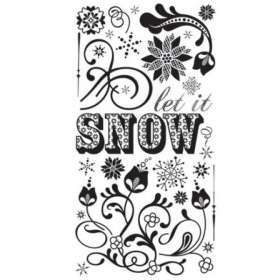 I love this line...it's perfect for Xmas/winter pics and cards!! it took me some time to warm up to these cold kisses, but now i'm in love with the line! thanks for the opp to win TSR! I love it; I just have not seen it in person anywhere yet. 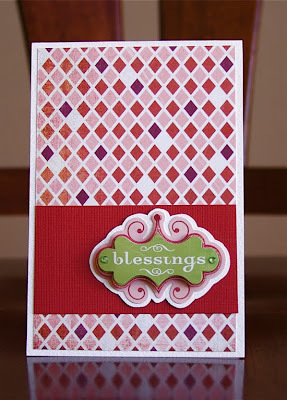 whooh love the cards you made with this pretty line! I love this line! thanks for all the beautiful projects and inspiration. I love love love Basic Grey. They come up with something awesome every time I turn around. I LOVE this line! That little reindeer is just the cutest lil thing!! And GREAT cards! just loving that cute retro look~! What is not to love. Basic Grey rocks! OMG!!!!! love it love it love it!!!!! yup, this collection definitely rocks my world! i'm always a fan of the BasicGrey christmas collections and this one is my favorite ever :) your cards are fabulous! I love every single paper and embellie that Basic Grey puts out, but this surpasses them all. Love those woolies. Love this line, will definitely be picking some (more) up! Love your gorgeous cards too! I can honestly say that this line did not WOW me when I first laid eyes on it... But after seeing all the projects I am reconsidering my original opinion!!! Thats why I love this site so much! Totally love this collection - This is my favorite Basic Grey line by far!!!!! Love all your lovely creations - here's crossing my fingers to win! Loving the colors! Would be great fun to play with! Thanks for the chance to win this collection. I think the colors are just fabulous. Put me in. I'm loving what I see. BG does it again. I love your projects. Such a lovely collection! Beautiful cards too! This line is definitely on my wish list and I just ADORE those little woolies, they are sooo cute!! yep, need it. Gotta have it. Its just too pretty to pass up! This paper is so beautiful! As usual, Basic Grey has done an awsome job! I love this collection. The Woolies are my favorite! I just love he great colors. What absolutely beautiful cards---thanks for so many great ideas! I think it is a beautiful line! I especially like its versatility in that it can used for Christmas or winter or whatever layouts! 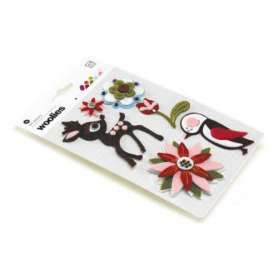 And those felt embellishments are SO CUTE! I love this line! I'll definitely be looking for it at my LSS. I think BG has really hit the nail on the head with this collection! It is super cute and very versatile. I love the woolies and the cute chipboard pieces the best I think. TFS your ideas and talent with us! I love this line! It rocks! Thanks for the chance to win this! I love everything from Basic Grey and this line is no different. I love it! 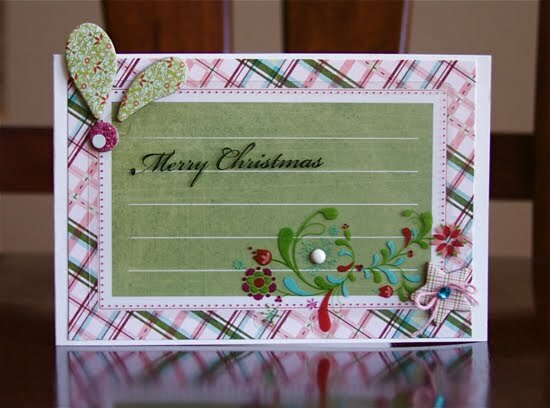 I Love the soft colors for Christmas, pink and pale green. Way to go Basic Grey! Basic Grey is my favorite line of paper and wow, love the whole line. Your cards are gorgeous. My favorite is the circle scalloped card. Absolutely gorgeous. I love the pearl accent. Thank you for sharing your work! Gorgeous cards! Love the layered snowflake! 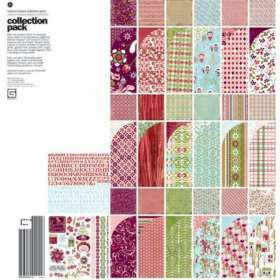 It is such a beautiful collection I would love to play with it and make cards just like yours! They are gorgeous!!!! This line rocked... i have purchased a couple pieces, but most stores near me are already out of it!!! I'm really excited about this line. I just love the woolies! I believe I love everything Basic Grey makes - this is no exception! Initially, the line didn't do much for me, but after seeing all the cute stuff you've done with the product, it's grown on me a lot. I can definitely see myself using it. Such an adorable line! I love the deer and the papers are great! You do an amazing job on your samples. I do love their work!! The colors are wonderful and the variety in the line is awesome!! Gotta love Basic Grey!! This is a super fun line!! I'd love to win it. I can just imagine all the fabulous stuff I could create!! This line is so fun and whimsical! I must have it! Great project Ashley and I love how versitle you made it. Thanks for the AWESOME giveaway! I would just love this in my stash and hope you sometimes have winners in the UK! love love love this! thanks so much for a chance to win. Basic Grey paper and products are always some of my favorites, so that's a no brainer for me. But your examples - tres magnifique! Awesome use of the products - definitely some scrap lifting going to take place here! Awesome. I love Basic Grey and loved all the samples on how to use the line. I love this line, it's absolutely the cutest! Thanks for the chance to win it! Just another great collection from Basic Grey. They seem to never disappoint. I think it is one of the best Christmas collections this year. Love love love it! Total BG addicted! First of all, basic grey is my favorite paper company! 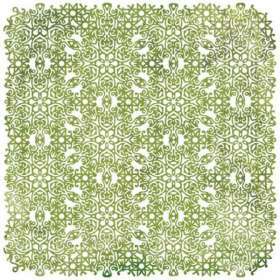 They did not disappoint me either because I love this paper and their embellishments! 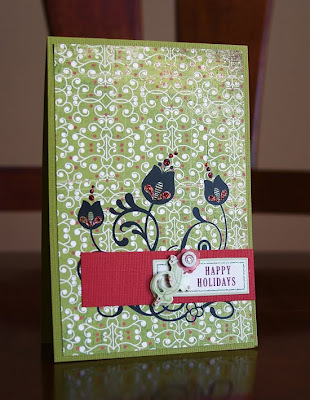 I asbolutely love the embellishments and cards. I have to admit I have a soft spot for Rudolf!!!! I have been enjoying all the projects you made with the line!!! It all turned out great!